I don’t know if it was “I Dream of Jeannie” (I was OBSESSED with that show as a kid), the mid-century timing of the space program, or this book. But I’ve had a fascination with the Kennedy Space Center (or, as I knew it growing up, Cape Canaveral) for a long, long time. When my parents moved permanently to Florida a few years ago, I knew that a trip there was in the works. We waited for Noah to be old enough to appreciate the visit (as well as have the stamina to sustain a long-ish drive and very full day), and this was the year. Chelsea was with us on our regular February trip so the 5 of us got up bright and early one day during our stay and headed out. 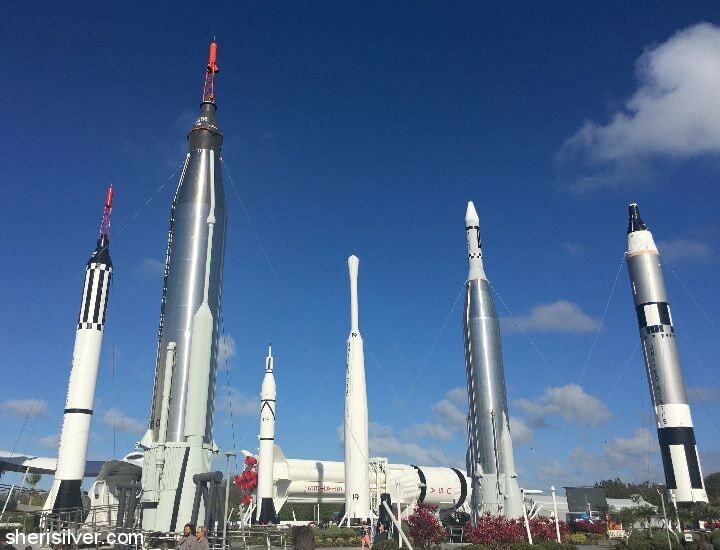 The John F. Kennedy Space Center (KSC) has been used for every NASA human space flight since 1968. 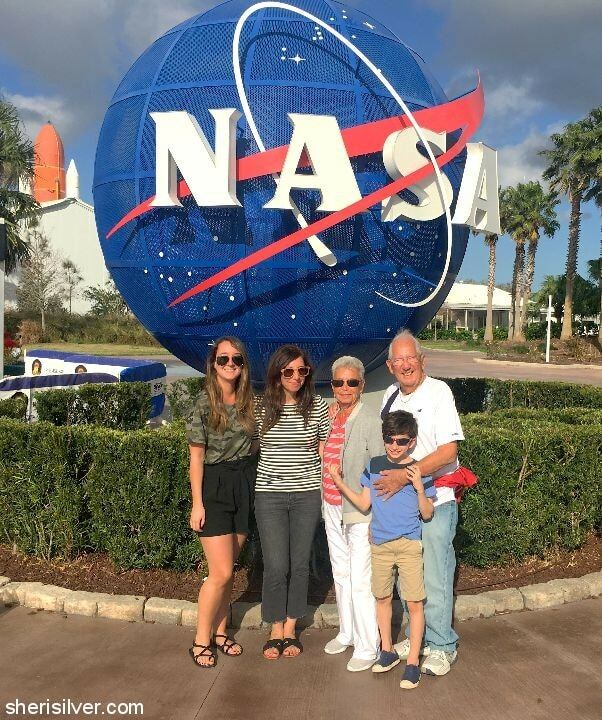 There are hundreds of exhibits and attractions to explore – and we only had one day – but I really feel like we had a very full experience, and I highly recommend a visit if you are anywhere near the area (my parents live in South Florida and it was a very easy 2 1/2 hour drive). I was overwhelmed as I sat to write this post (how to summarize? what to include? 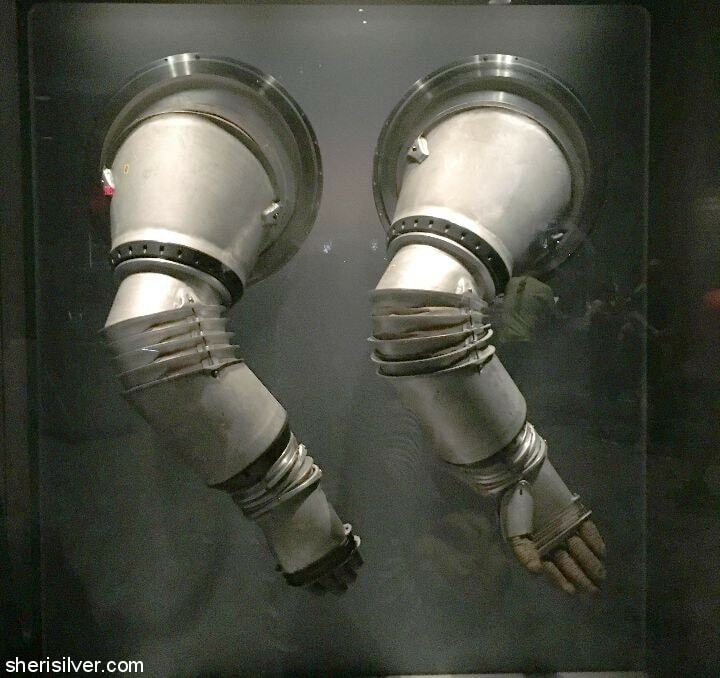 ), and decided to share our particular day, as well as links to the KSC site that are most helpful for planning your trip. I started with the KSC trip planner. You answer 3 quick questions and a customized itinerary is generated. This was a good place to start as it provided the suggested highlights for us to hit, based on Noah’s age and the amount of time we had to spend. 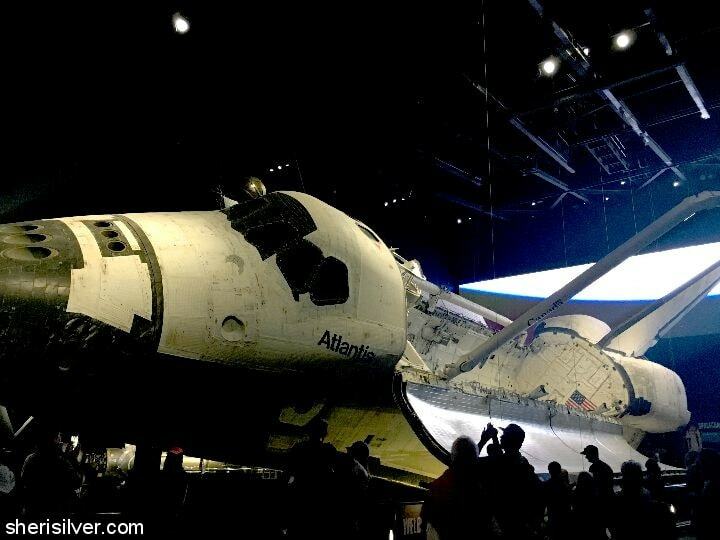 We started at the Space Shuttle Atlantis – home of this historic spacecraft. 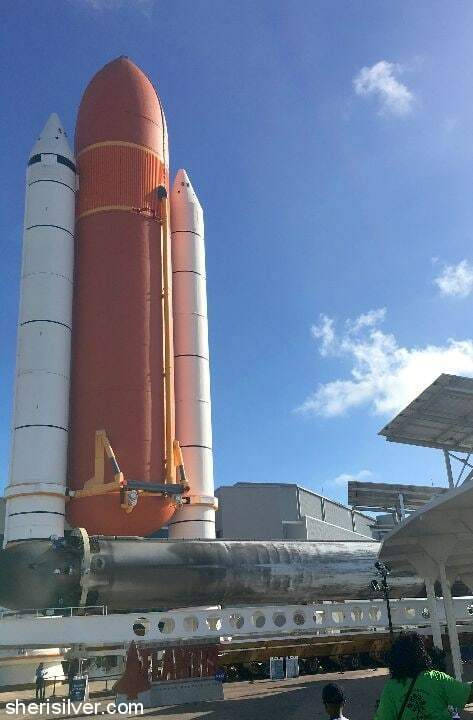 Outside the exhibit is a full-scale space shuttle stack of two solid rocket boosters and orange external tank. The visit commences with a short film, after which the curtains open and you are greeted with the Atlantis itself (major “wow” factor here). It is suspended from the ceiling and the cargo area is open for viewing – quite a sight. 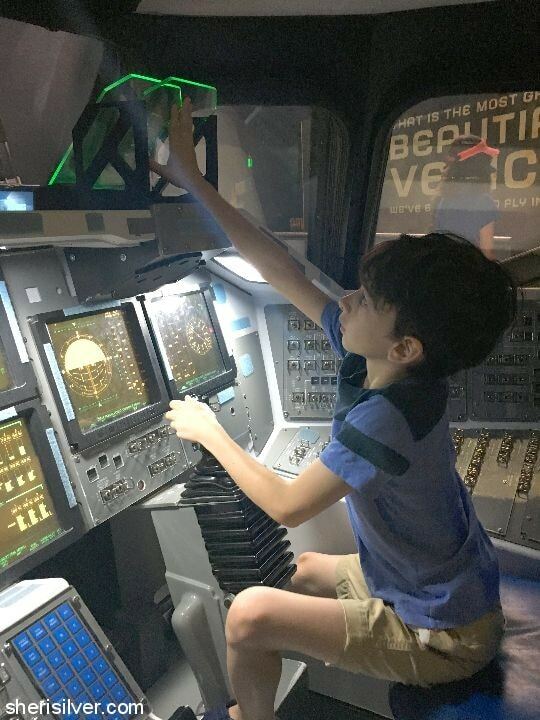 There are lots of astronaut training simulators that Noah loved exploring, and I personally enjoyed the displays that shared what life was like for astronauts in space – where they sleep, how they eat and even how they use the bathroom! 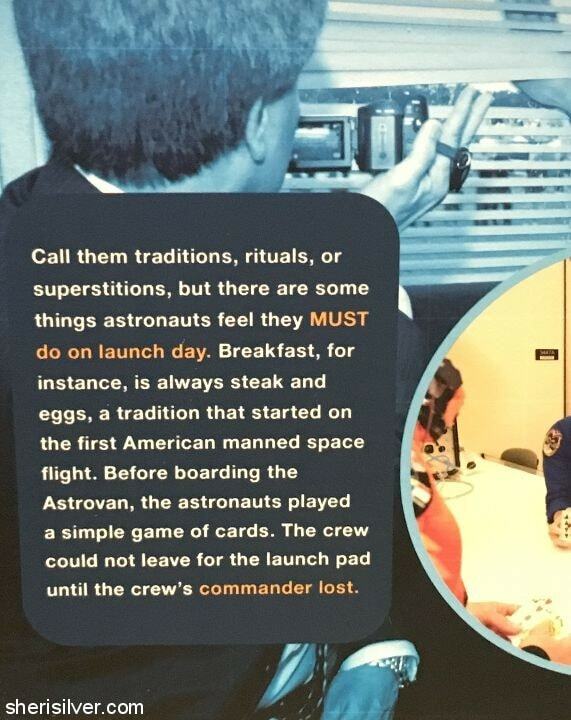 There was even the vehicle that transports the astronauts on flight day – including some interesting trivia about the traditions that take place (without exception) before every flight. 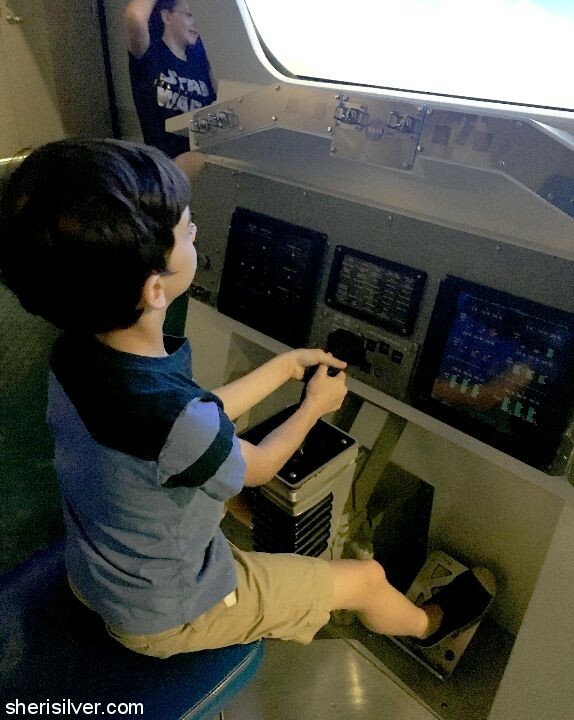 Noah and my parents also did the Shuttle Launch Experience, which simulates the space shuttle’s 8 1/2 minute ascent into orbit. You enter the heart of space shuttle operations for a pre-launch “briefing” by veteran space shuttle commander Charles Bolden, followed by an experience that veteran NASA astronauts call “the next best thing to flying aboard the space shuttle”. 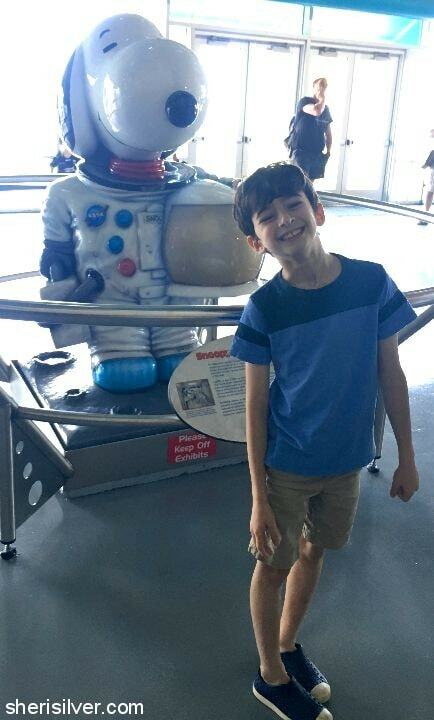 Noah LOVED it (note: there is a height requirement of 44″ to enter, and lines can be long so try to get there early in the day). We had a nice lunch at the Orbit Cafe (one of several dining spots well spaced out all over the center), and got on a fast-moving line for the KSC Bus Tour. This was the highlight of our trip for sure. The bus ride is about 40 minutes, and you get to see the iconic Vehicle Assembly Building along the way. 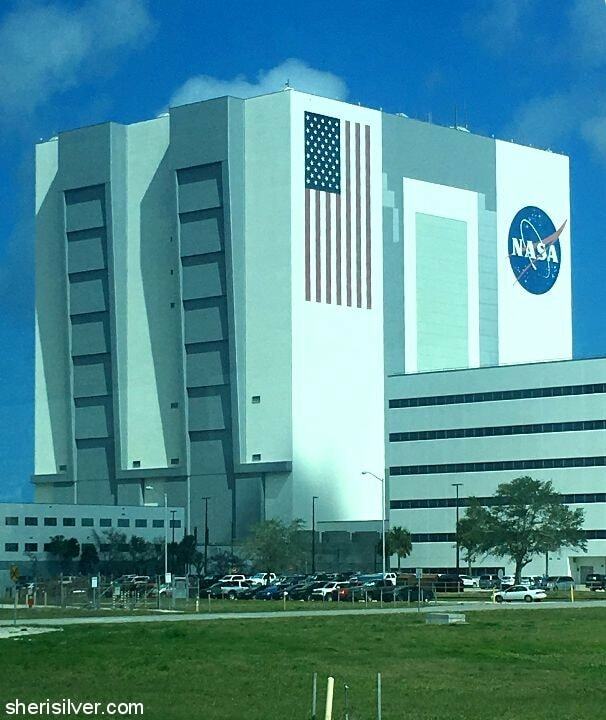 This is where the rockets are held until launch day, and it’s hard to grasp the enormity of this building in a photo (for reference, our delightful bus driver pointed out that the flag is the size of two NBA basketball courts, and each stripe is approximately 8′ wide, the stars 6′). There are alligators to look for along the way in the canal that runs alongside the route, and (somewhat randomly) a 50-year-old eagle’s nest (measuring 12′), where we saw 2 eaglets learning to fly. 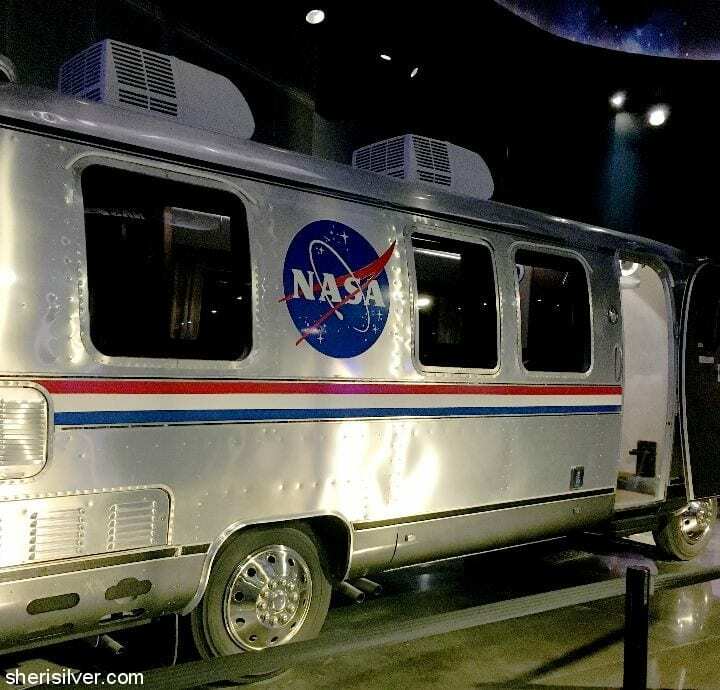 The bus deposits you at the Saturn/Apollo V Center, where you can easily spend 1 – 2 hours. You begin the visit with a short film that shares JFK’s vision for putting a man on the moon. 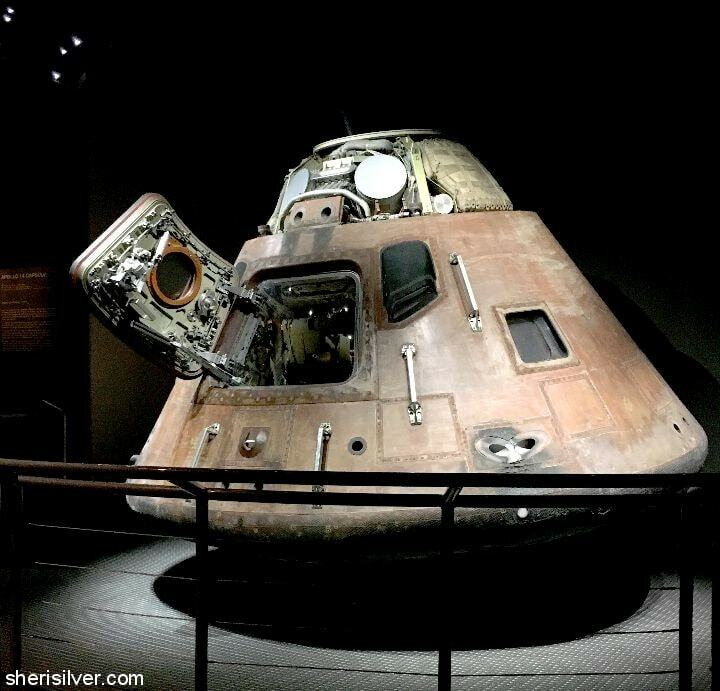 You then enter the Firing Room Theater, where you’ll experience the countdown for Apollo 8 from a viewing area that overlooks the actual consoles used during the Apollo launches. You see and feel the Saturn V moon rocket lift off from the launch pad and blast into space. From the theater you enter a cavernous space containing the centerpiece of the Center – the Saturn V.
All 3 stages are on view, and you can walk under and around the largest rocket ever flown through space. 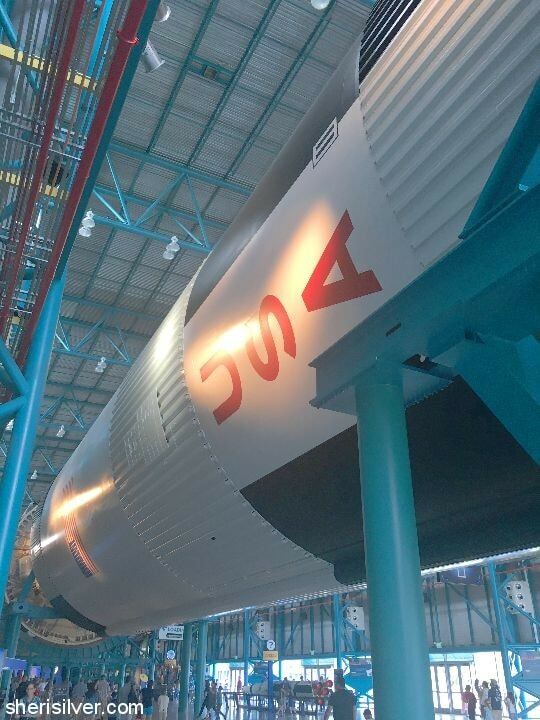 Although 13 Saturn V rockets were launched between 1967 and 1972, this is one of only three remaining in the U.S.. You can then spend time exploring the many interesting artifacts on display. Touch a moon rock, see Alan Shepard’s (moon dust covered) space suit and get a picture with “Astronaut Snoopy” (read more about Snoopy’s connection with NASA here). We finished up our day with the multimedia exhibit “Journey to Mars Explorers Wanted“. 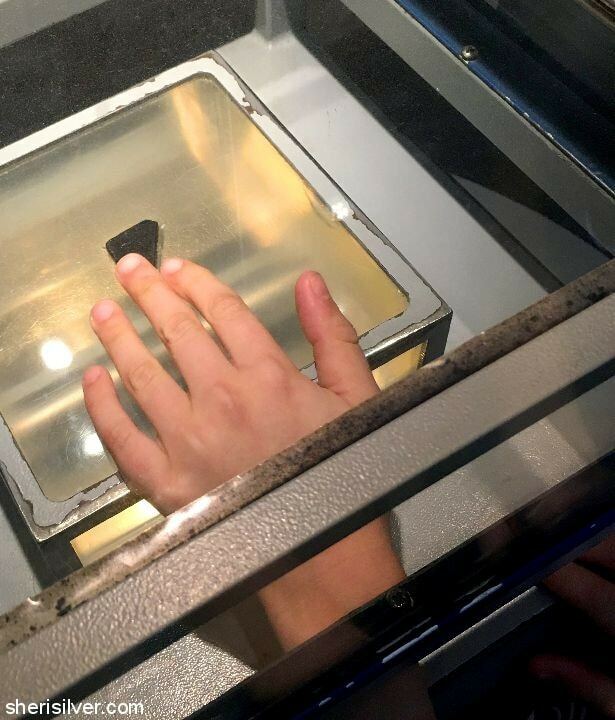 It included a live presentation, highlighting NASA’s plans to explore Mars, asteroids and once again, the moon. 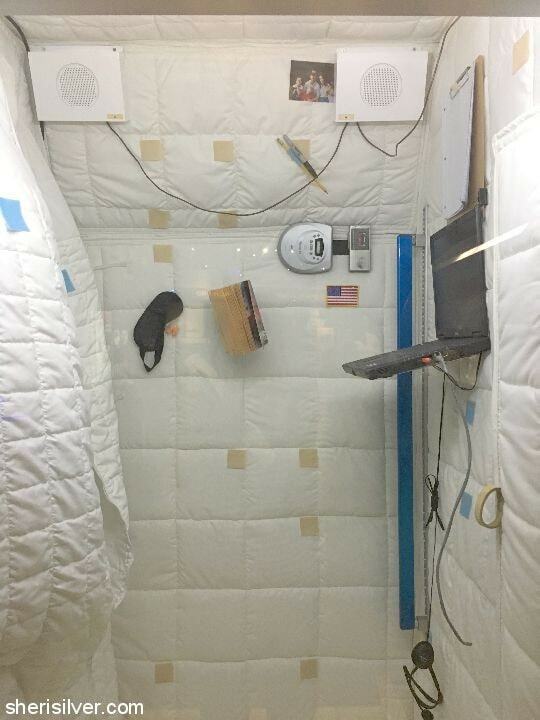 There are more interactive games and simulators, along with mock-ups of Mars rovers. 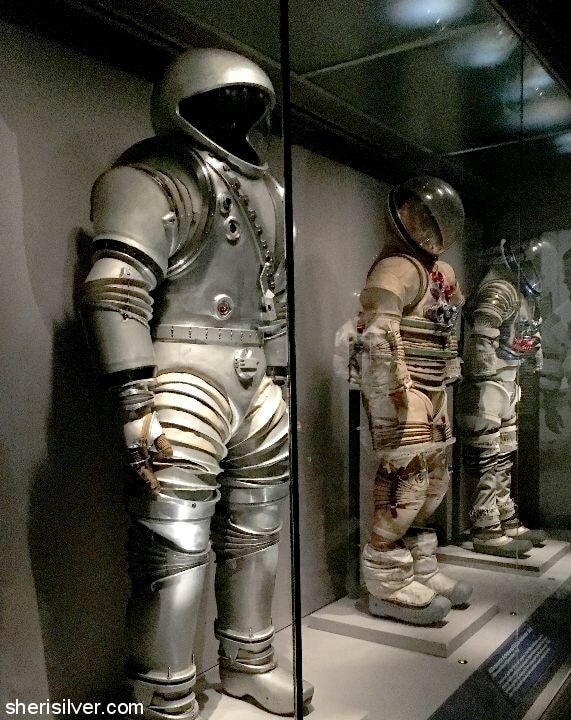 All of these exhibits – in addition to two IMAX movies and the Rocket Garden (which we didn’t have time for on this visit) are included with the price of admission. There are add-on experiences (such as Lunch with an Astronaut and Astronaut Training Experience) for those super-fans out there. The grounds and facilities were clean and well-kept, and every single staff member we encountered was friendly, enthusiastic and eager to share tips and information. All told we had a fabulous and memorable day! Note: I was not compensated for this post. 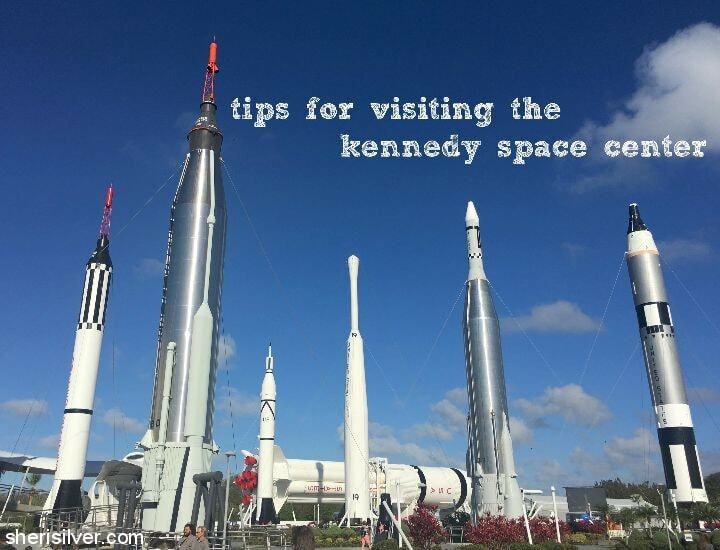 The Kennedy Space Center kindly sent me 2 complimentary tickets for use on this visit; all comments and opinions are – as always – completely my own.